The global toxicology testing services market was valued at more than US$ 6 Bn in 2017. It is projected to expand at a high single digit CAGR during the forecast period from 2018 to 2026. Increase in demand for detection of toxicity of products during their early stages of development, rise in R&D expenditure, growing preference for outsourcing of toxicological studies to contract research organizations, rise in consumer awareness about safety associated with the use of health care and cosmetic products, and increase in concern of toxicological effects of agricultural products on food and environment are some of the factors boosting the demand for toxicology testing services. Moreover, emergence of technologies, such as predictive toxicology testing services which avoid the use of animals for toxicology testing and stringent regulations associated with toxicology testing before marketing approval of new molecules are expected to drive the growth of the global toxicology testing services market during the forecast period. The global toxicology testing services market has been segmented based on method and type of industries. In terms of method, the global market has been classified into in vivo method, in vitro method, and in silico method. The in vivo toxicology testing method dominates the global market, in terms of value, due to high cost associated with this type of testing methods. In vivo toxicology testing is expensive, lengthy, and painful to animals used in the testing procedures. Various ethical communities are banning the use of animals for research and testing of toxicity of chemicals. This has given rise to alternative methods of toxicology testing, such as in vitro and in silico methods, which is also known as predictive toxicology testing methods. The market for in silico toxicity testing is expected to expand at a significant CAGR during the forecast period. In terms of industry type, the global toxicology testing services market has been categorized into pharmaceutical and biotechnology, cosmetic, chemical, medical devices, and other industries, including agricultural, food, and environmental organizations. The pharmaceutical and biotechnology segment held a major market share in 2017. This can be attributed to the rise in R&D expenditure of these industries, increased outsourcing of preclinical studies to contract research organizations which enables them to manage R&D costs and focus on their core competencies, and increase in pressure from regulatory agencies for toxicity tests to prove product safety to get market approval. The cosmetic industry is expected to grow at a significant CAGR during the forecast period owing to increased use of cosmetic products across the globe and rise in consumer awareness about safety of these products. Geographically, the global toxicology testing services market has been segmented into North America, Europe, Asia Pacific, Latin America, and Middle East & Africa. North America dominates the global toxicology testing services market due to presence of a large number of toxicology testing service providers, high health care spending, and stringent regulations governing safety assessment of chemicals and medical devices. Europe is the second leading market for toxicology testing services, which can be ascribed to the amendment of regulation made by the European government to assess the safety of chemical substances. For instance, the REACH Regulation (EC) No 1907/2006 became effective in June 2007 with the objective to protect human health and the environment from the risks posed by chemicals, while enhancing the competitiveness of the EU chemicals industry. Asia Pacific is projected to expand at a significant CAGR during the forecast period owing to emergence of CROs offering toxicology testing services as per regulatory requirements in lower cost than in other developed regions. 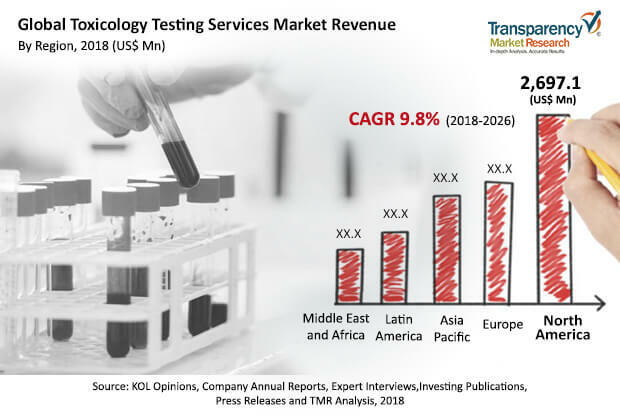 Major players operating in the global toxicology testing services market include Laboratory Corporation of America Holdings, Charles River Laboratories, Inc., Eurofins Scientific, Bureau Veritas, Envigo, Evotec AG, Merck KGaA, SGS Group, Pharmaceutical Product Development, LLC (PPD), and WuXi AppTec. Key players are expanding their product portfolio through mergers & acquisitions and partnerships & collaborations with leading pharmaceutical and biotechnology companies and by providing better services at a lower cost. This comprehensive report by Transparency Market Research analyzes the global toxicology testing services market for the period between 2018 and 2026. An in-depth and unbiased market assessment has been made, which offers readers an in-depth and accurate analysis. Market projections have been offered in terms of value (US$ Mn). Stakeholders of this report include companies and intermediaries engaged in research & development of new drug molecules, new chemicals, manufacturers of chemicals listed under REACH regulations, and toxicology testing services providing contract research organizations. The global toxicology testing services market has been studied for the forecast period from 2018 to 2026. For research, 2017 has been considered as the base year and 2016 as the historical year. The global toxicology testing services market report comprises an elaborate executive summary that provides overall information about various segments of the market. The report provides a detailed competitive landscape, by major players operating in this market along with their shares (value %) of the global toxicology testing services market for 2017. The report also provides detail company profiles of emerging market players operating in the global toxicology testing services market. The market overview section comprises impact factors such as key market dynamics including drivers, restraints, and opportunities, affecting the outsourcing of the toxicological testing services to contract research organizations in the global market. These factors are likely to aid stakeholders establish a strong foothold in the global toxicology testing services market. Furthermore, the market overview section comprises key industry events, service portfolio overview of leading players and market attractiveness analysis in the global toxicology testing services market. The market attractiveness analysis provides a graphical view comparing the expansion and market dynamics in various segments and countries to identify the most attractive market. The global toxicology testing services market has been segmented based on method and type of industry. In terms of method, the global toxicology testing services market has been segmented into in vivo methods, in vitro methods, and in silico methods. Based on industry type, the global toxicology testing services market has been categorized into pharmaceutical and biotechnology, cosmetic, chemical, medical devices, and others, which includes food, agricultural, and environmental industries. In terms of geography, the global toxicology testing services market has been segmented into North America, Europe, Asia Pacific, Latin America, and Middle East & Africa. Moreover, quantitative analysis for the major countries comprising the U.S., Canada, Germany, France, the U.K., Italy, Spain, Russia, China, Japan, India, Australia & New Zealand, Brazil, Mexico, South Africa, Israel, and GCC Countries has also been provided in the report. A detailed qualitative analysis of factors responsible for driving and restraining the toxicology testing services market in various regions has been provided in this section. The report provides a detailed outline/blueprint of the toxicology testing services market globally that is expected to assist new companies establish their presence and market players in expanding their share in the market. The report concludes with the company profile section, which includes company overview, financial overview, SWOT analysis, product portfolio, business strategies, and recent developments for market players.